CPU/PCIe Power Supply - Why So Many Connectors on Motherboard? CPU/PCIe Power Supply – Why So Many Connectors on Motherboard? MSI just announced a new motherboard, MEG X299 CREATION, which is the first consumer motherboard that comes with 3 x 8 pin CPU power connectors. Lots of users have question such as do we need to plug in power cables from PSU to all of those CPU power connectors to get the system work. We will get to that later. To begin with, let’s talk about motherboard CPU power connector. 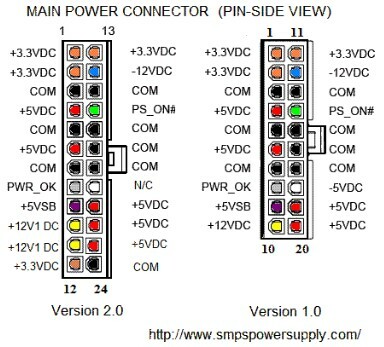 You may refer to figure 1. to understand the pin definition vs color scheme of cable such as yellow cable = 12V output/red cable = 5V output etc. This color scheme is universal and standardized for all the PSU. As the power requirement goes higher along with the more modern CPU, Intel has announced a new CPU power connector regulation which is consisted of 8 pin instead of 4 pin connector. Nowadays, we even have 8+4 pin, 8+8 or more CPU power connector on the motherboard. By design, each pin can sustain up to 7 to 8A. Figure 2. is the pin definition of CPU power connection. From the equation of Power = Voltage x Current, we can say each CPU power connector can sustain up to around 12V x 7A x 4 = 336W. With 3 CPU power connectors, it means the motherboard can supply up to 336W x 3 = 1008W to CPU. But do we really need 1000W on CPU for average use? The answer is no, it is mainly designed for extreme overclocking LN2 condition. How does 3 connectors design benefit average users though? You might hear from someone or see on the internet that a motherboard catches on fire and burns down the whole thing (worst scenario!!!). One thing you need to know is that basically all motherboard vendors use fire-proof material for on-board connector to prevent those situation. So why does user still see this? It usually needs to come down to the PSU itself. There are tons of PSU manufacturer in the market, and there is no way that you could know whether the PSU is using decent material for wire cable or not (we’ve seen vendor that uses aluminum instead of copper for wire and it is definitely a bad idea because it heats up so fast and fragile). 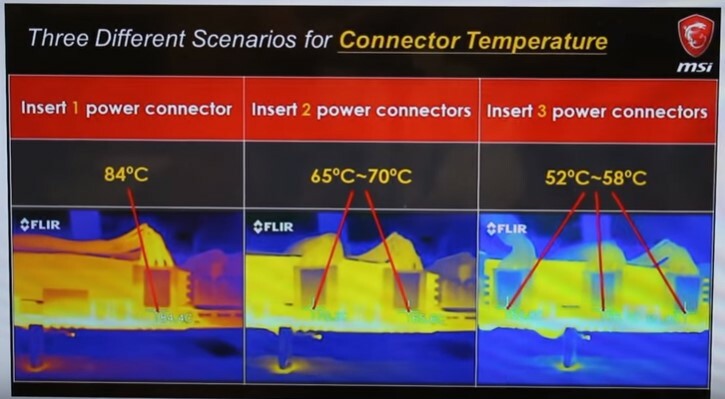 Theoretically, if motherboard has more CPU power connector, it will allow user to disperse the total current equally to different connector which could effectively reduce the power cable temperature because we know more current flow equals higher temperature. To prove this, please refer to figure 3. As you can see, with the same PSU/cable and under the same condition, the number of power connectors used is inversely proportional to cable temperature. 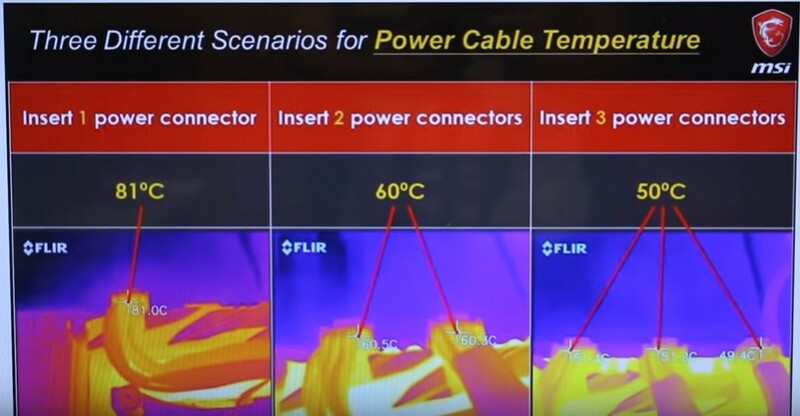 From figure 4., you can also see the connector temperature is affected by cable temperature. Noted that the motherboard connector always uses fire-proof material so it is okay to tolerate such high temperature. In most of the case, we notice the problem is due to the PSU connector but not the motherboard connector that starts to overheat and eventually burn down. This is why we want to have 3 CPU power connectors on the motherboard for MEG X299 CREATION. As you know that new Intel CPU i9-9980XE has STIM (Solder Thermal Interface Material) solution, comparing to pervious CPU, it has better thermal behavior. (ie. Old CPU can easily hit thermal throttling under certain task while i9-9980XE has better thermal behavior, it has more potential to do heavier task, which requires more power draw, without hitting the temperature ceiling **Unless you delid**) The goal of MSI X299 Creation is to fully support i9-9980XE and from MSI internal test, with such design, it is possible that we can run stress test @ 4.8GHz without any problem under normal condition (for average users). So do we need to plug in all 3 connectors to get the system work? The answer is no again, the motherboard will work just fine with 1 connector, but if you want to push your system to higher performance, you might start to consider filling all the CPU power connectors on the motherboard. Next is the PCIe power connector. Why is there an extra 4 pin PCIe power connector (PCIE_PWR1) on the motherboard? 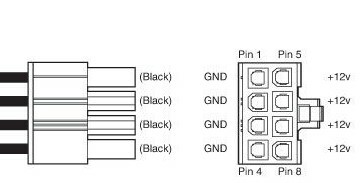 Let’s start with 24 pin PSU connector, it consists of 20 + 4 pin, the purpose of that +4 is because it needs to support 75W for PCIe device. However, the current graphics card can easily use more power than 75W, with only 1 x 12V cable (from +4 pin), it is clearly not enough. So nowadays, on lots of graphics cards, we have extra 6/8/6+8/8+8 etc connectors on it. For some graphics card, it has the design that the GPU would draw power from the extra pin on graphics card itself but the memory would draw power from PCIe slot (+4 pin of PSU), or even worse, the graphics card has no extra connector and the power would be all depending on PCIe slot. When you have multiple PCIe devices with that kind of design, apparently the little 12V connector from +4 pin of PSU is not going to be enough. That is when you need to plug in extra power to PCIE_PWR1 connector. Again, do we need to plug cable to PCIE_PWR1 to get the system work? Nope, but if you can spare a power cable for it, why not? Lastly, for PSU you can also pay attention to the rail design (single/multi-rail). There’s always current limitation for single rail and sometimes when system is requesting heavy load of current from PSU, it can trigger the self over current protection which causes PSU to shut down. When this happens, you can try to use different rail source for things like CPU_PWR1/2/3 to avoid the abrupt shut down.